EQUANIMITY is a state of psychological stability and composure which is undisturbed by experience of or exposure to emotions, pain, or other phenomena that may cause others to lose mental balance. Obatala uses it to create strategic advantage. According to classical Yoruba teachings on the divinity, a life well lived encompasses four essential "Paths to Equanimity", very loosely translated as Austerity, Creativity, Happiness, and Generosity. Each is recognized as a different aspect of the orisa's essence and therefore all four together represent the most satisfying and bounteous life experience. In this one of a kind treatment of Obatala, Baba Obafemi will introduce one of the paths with teachings from the ancient texts; he'll then offer practical self-exploratory exercises relating to that path; and finally, he will lead you in a series of activities to facilitate your own personal connection with the magnificent energy of Obatala, the Great Orisa. Take the four week class! FUNDAMENTALS of ORISA LIFESTYLE: Obafemi Origunwa, founder of the Orisa Lifestyle Academy and creator of the Orisa Lifestyle Agreements, articulates an in-depth, yet simple blueprint of the world's fastest growing spiritual movement. 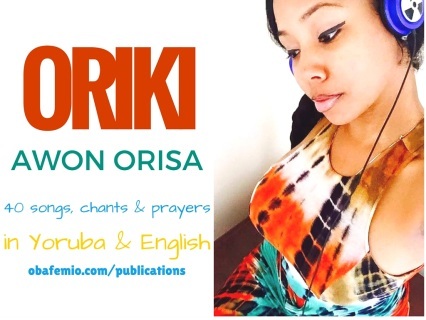 In his insightful study, Origunwa surveys a full range of traditional and modern African thought expressed through religion, sacred poetry, philosophy, mythology, psychology and business. He demonstrates that Yoruba sacred culture is far from being doomed to destruction or irrelevance at the hands of Islamic and Christian incursion. Instead, Orisa Lifestyle is evolving into a world wide cultural empire that is capable of actually using foreign tools to propagate its basic values. 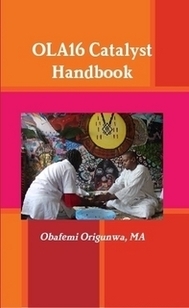 The Fundamentals of Orisa Lifestyle presents an invaluable insight into the foundations of the unique and vital tapestry of Yoruba indigenous knowledge systems practiced by over seventy million Africans all over the world. Check out the CLASS. Have you ever wondered what you're supposed to do BEFORE and AFTER initiation? Have you been in search of a simple, daily practice that would guide your spiritual development? Have you ever wanted to know basic things you could do in between readings, sacrifices and initiations? Finally, your search has ended!!! The PÀTÀKÌ Practical Guide to Orisa Devotion is just what you've been looking for. It will help you to remain ever-focused on the way of your Personal Priesthood, which will amplify your spiritual insights. It's ideal for devotees within ALL Orisa traditions. ​The PÀTÀKÌ Practical Guide to Orisa Devotion will help you to align yourself with the patterns of Creation, as defined by our Yoruba ancestors in West Africa. Enroll in the CLASS. The Orisa Lifestyle Catalysts' Handbook is PERFECT for organizing. It has step-by-step instructions for building membership, assigning tasks, setting up meetings and launching a local campaign to transform your spiritual community into a hub for local families and devotees. By completing the activities in the Orisa Lifestyle Handbook, you will gather precisely those experiences that will cultivate your spiritual values and enable you to deliver upon the Ancestral Promise.